On this snow day, it seems fitting to highlight one of the strangest snow phenomenon I have ever encountered. The resort is called Ski Dubai, and is located in Dubai, in the desert climate of the United Arab Emirates. This 22,500 square meter facility in home to five ski slopes and 6000 tons of artificially made snow. I couldn't believe it either when I heard it! However, a peek at Snopes.com and a BBC article reassured me that it does exist. 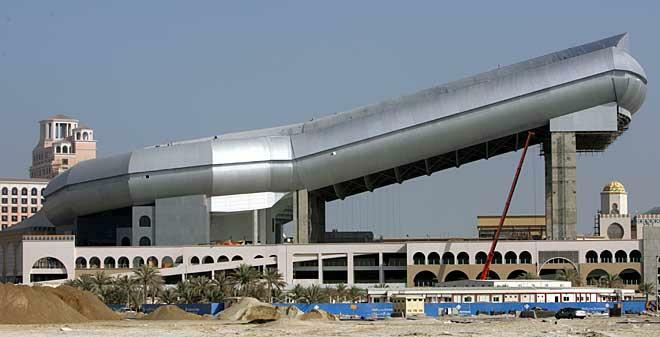 You can visit Ski Dubai's website for more information, including a .pdf on how the snow is made. Ski Dubai has real snow. Snow is made using a simple procedure similar to how snow is made at outdoor ski resorts. Pure water, with no chemicals added, is put through a chiller to cool. It is then sent through pipes to the snow guns which are on the ceiling. When the cooled water is blown out into a freezing cold environment, it crystallises and makes snow. The final product is real snow, as if it came from nature. We just give it a little help. Yeah, and another thing that helps keep the snow around are the kilometers of tubing that run under the snow base to chill it. (Think: the tubes on the back of your refrigerator.) The place manufactures 30 tons of snow daily. Year round. Whoa.